I was truly blown away by STM and all that they offer, if you don’t know about them, you totally should get in the know! Founded in 1998 just outside Sydney, Australia in the famous suburb of Bondi Beach, our mission was, and still remains; to come up with a more comfortable, secure and stylish means of transporting your digital gear. 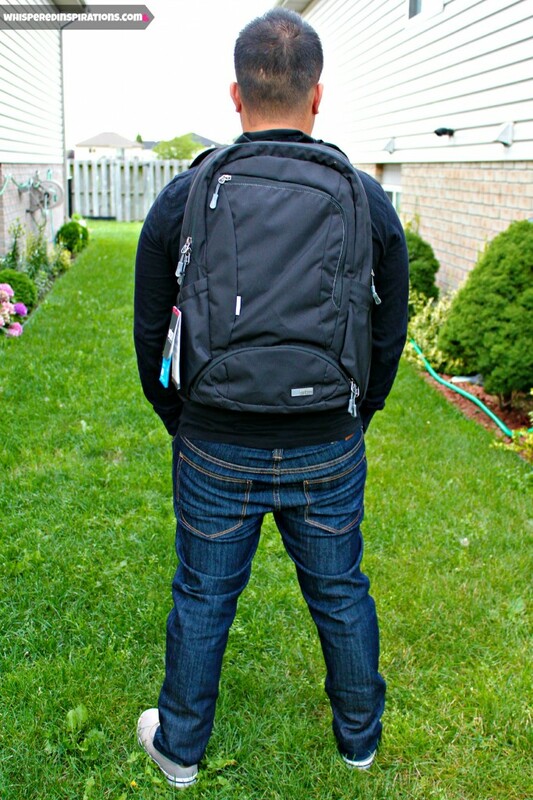 Today, STM makes a variety of laptop bags, laptop backpacks, fitted tablet and phone cases. All designed to make life a bit more worry free. We don’t use wasteful stuffing. All of our products are shipped in biodegradable plastic bags, and we use minimal product packaging. We take great pride in our ongoing “Born to Be Green” corporate sustainability programs. Gear That Travels With You. Since I travel and travel often, I was always on the search for the perfect carrier for my technology. When I travel I usually have my laptop, camera, tablets and smartphone with me. Not to mention, that includes my agenda, important documents, pens and tons of cables. Of course, it is all depending on the length of the trip and the nature of it. While I have a purse tote for my laptop, I have to say it’s more stylish than functional and it doesn’t fit everything that I need it to. 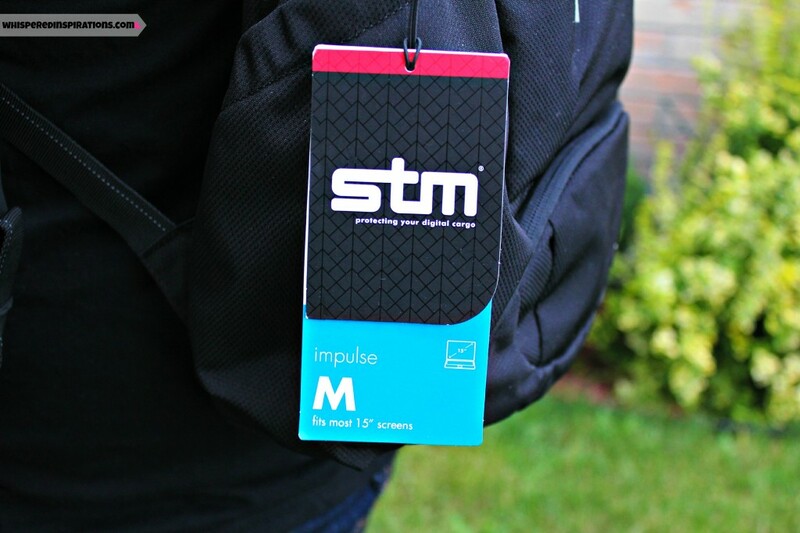 While I was in town in Toronto for TBEX this May, I had the chance to meet the wonderful people behind STM Bags. I was super stoked when they wanted me to review some of their awesome gear since I was seeking accessibility, functionality and style. Something that was all-in-one and that can help me to carry my gear safely. And above all, something that both my husband and I could share, just as we share our love for gadgets. 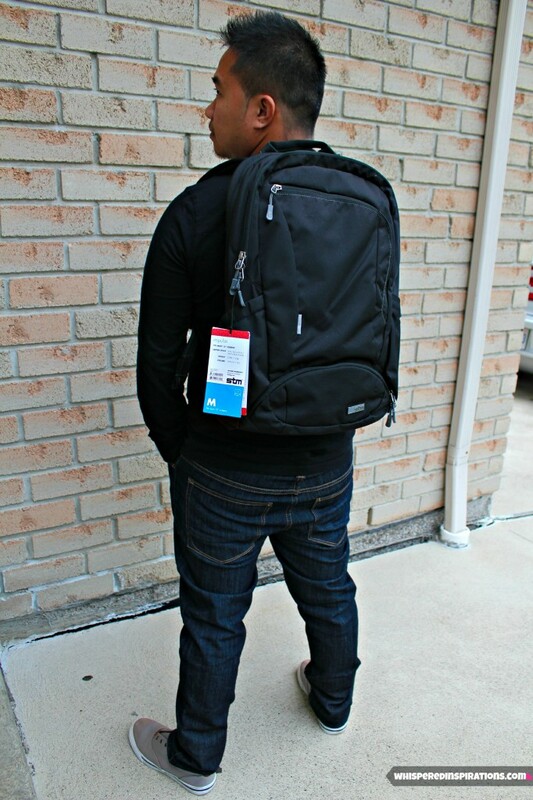 The Impulse Medium Laptop Backpack. 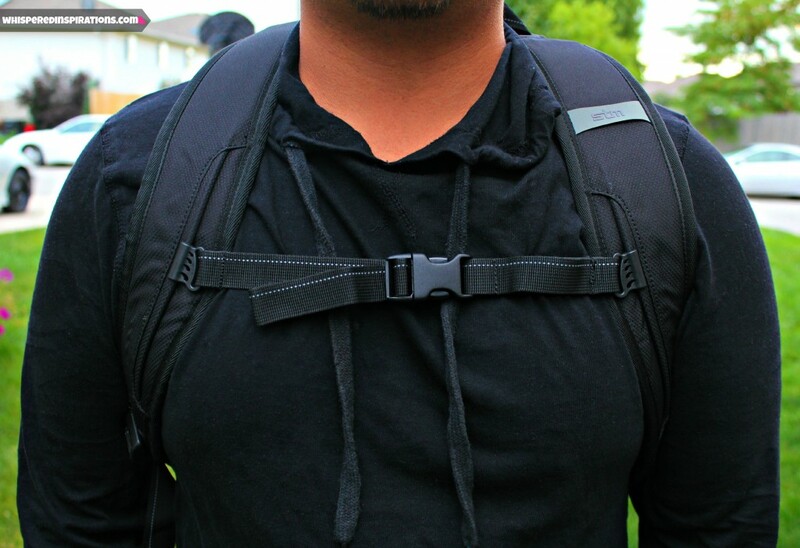 What I love the most is that the Impulse is lightweight, it has a sternum strap so that it stabilizes your load and that it has a luggage pass through for our luggage. The straps are very heavy duty and are very strong yet comfortable. The main compartment holds my 15′ inch laptop, my Samsung tablet and Mimi’s iPad. While the second pocket holds my planner and any other important papers and pens and business cards. For the price tag of $100, you really can’t go wrong. It makes a perfect carry-on for short trips too. The best part is that it is made to fit up to a 15’inch laptop and it fits like a glove. I sure do, it’s frustrating getting to your destination and having a huge mess to unknot when they’ve unravelled in my luggage and I have to search for them. 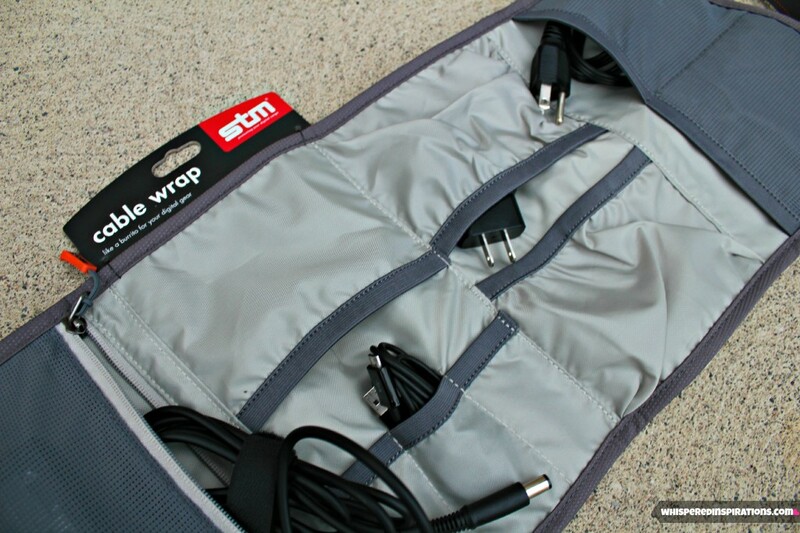 With the STM Cable Wraps, you have organization at it’s best. Organize and protect your cables, hard drives and digital accessories. 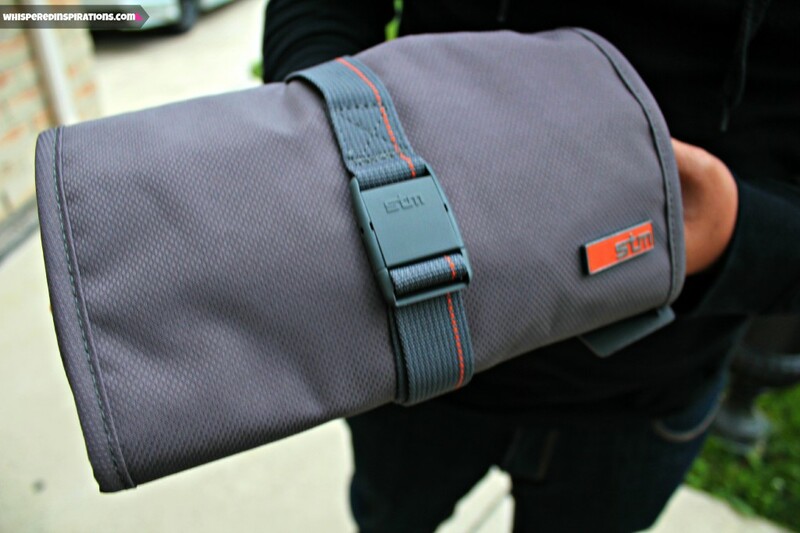 Win 1 of 2 STM Cable Wraps! STM Bags is giving away 2 Cable Wraps for TWO lucky Whispered Inspirations readers! Kiss your organization woes away and enter to WIN now! This giveaway is open to the US and CANADA and starts today on August 21st, 2013 and ends on September 05th, 2013. What do you look for in traveling gear? I look for organization and protection when packing my technology for travelling! I look for ease of access to the cables but it has to be small enough and light enough to not add to an already heavy pack. I look for padding for both the equipment and carrying surfaces. I like durability and protection in case I drop. Affordable is always nice too! I look for protection! Travelling is so hard on electronics. I look for comfortable straps, lots of pockets and that it's well padded. I look for padding to protect from falls and bangs! Electronics break so easily! Lots of storage and security! these look fantastic, lots of extra pockets for storage for all the bits and pieces one has to carry along. I must mention this firm to my daughter, she live in Sydney Australia not too far from Bondi Beach. great bag! Sooo adorable! And I totally enjoy reading your blog! keep up the good work! I especially love the posts about your outfits!